Flipping furniture is a fun and creative hobby. But there is a dark side too. Injuries happen. 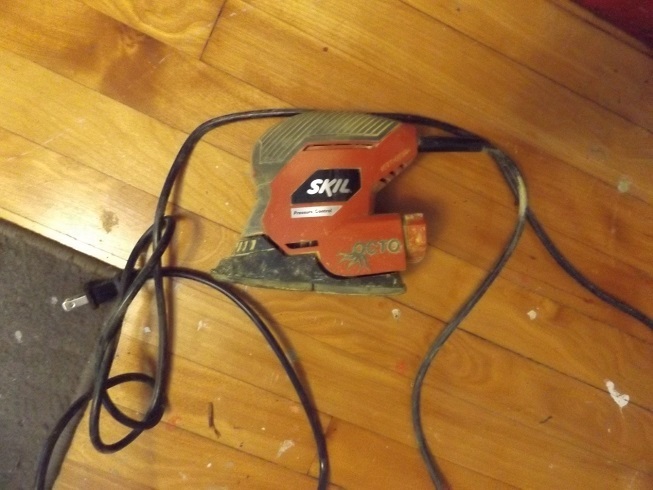 Luckily I haven’t cut off a finger or nailed something to myself by accent; I’ve not burned off skin with the sander or with chemicals; I’ve not had saw dust or paint chips fly in eyes. But I did have an injury last weekend while loading up the van for the market the next day. As you may know, I work out of my second floor apartment so every time I get ready for market I have to up and down the stairs carrying furniture. It IS like moving every weekend–twice. Anyway, it’s a miracle I haven’t incurred any of the injuries listed above and it’s a miracle I haven’t fallen down the stairs. But fall I did right off the curb and onto my knees. 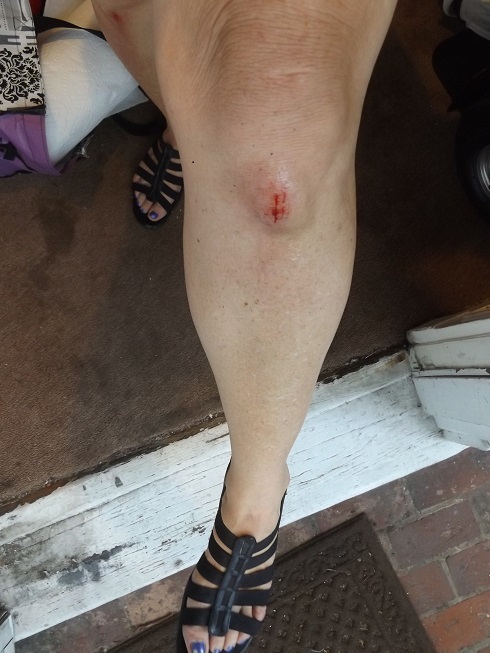 Luckily the ottoman I was carrying caught my fall so I didn’t go face down onto the street, just straight onto my knees. OOOOUUUCH!!! This is just one knee, both were badly banged up and bleeding. I felt like such a child. Now I’m walking around with bruised and scabby knees…isn’t that attractive? Needless to say, I’ve been wearing long skirts to work this week!! It’s another miracle that I haven’t had a huge spill and disaster in the room that I work in. I don’t have a good work environment at all. The space is crowded and yes, a mess. Working in there is a huge challenge. A couple of weeks ago, when I was getting ready for work I went into the work room to get something and I saw it…a nearly full can of new, read paint. What a mess!!! 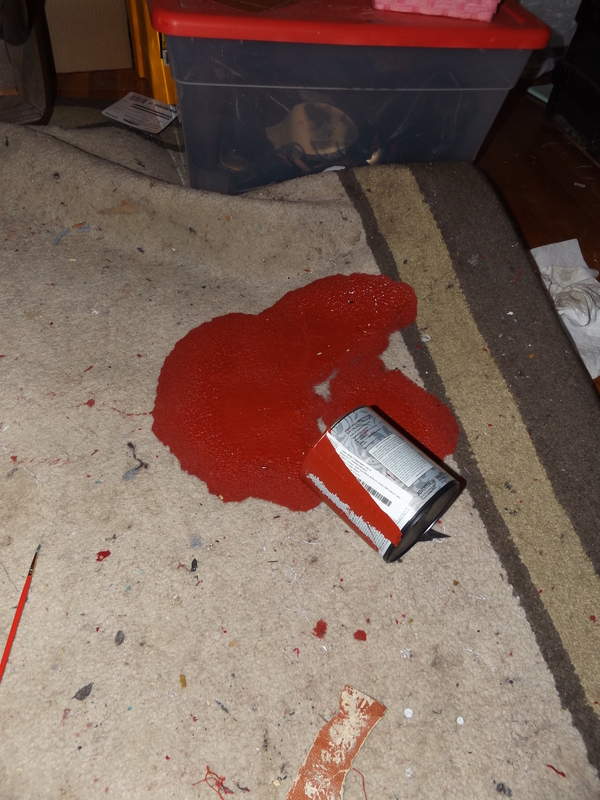 And oh, that beautiful paint that I had just used once…. I wasn’t sure if Mia had knocked it over or if I had the night before when I was putting a large table into the room. The paint had clearly been there for a while, the edges were drying, but luckily the paint didn’t seep through the carpet and onto the hard wood floor! Another miracle! It seems the flipping muses are watching out for me! Yes, death comes to flipping. I have now killed not one, but two sanders. I don’t know what their life spans are supposed to be but I clearly am hard on them. So now you know the “flip side” of the flipping! LOL! That was pretty funny if I do say so myself! Enjoy! ← From UGLY to BEA-U-TI-FULL!